Brother James Hayworth was awarded the Honorary Grand Rank of Organist at the Regular Meeting held in Lodge Carron No 139 on Wednesday 8th February 2012. The presentation was made by the Right Worshipful Provincial Grand Master Brother Andrew A. McKinnon. 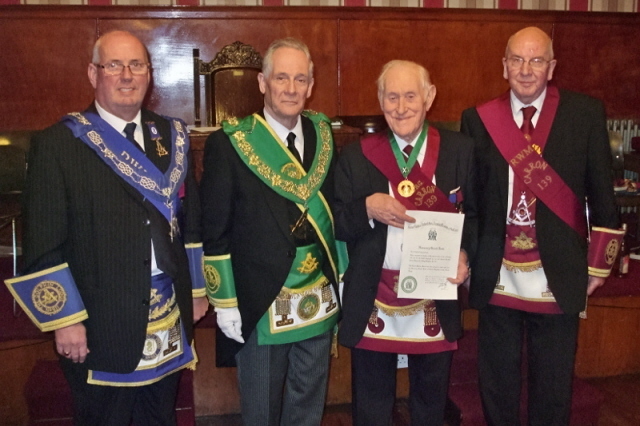 Jim is pictured with the Master of his Mother Lodge, Brother John B. Muir Lodge Dolphin No. 911, and the Master of his affiliated Lodge, Brother William Campbell Lodge Carron No. 139.